And the rout in U.S. markets continued to ripple around the globe. Japan's Nikkei index plunged 4% in Tuesday morning trading while the S&P/ASX 200 in Australia dropped 3%. The White House said in a statement that President Trump was focused on "our long-term economic fundamentals, which remain exceptionally strong." The statement cited strengthening economic growth, low unemployment and increasing wages for workers. Stocks sank throughout the day, then went off a cliff in the final hour of trading. The Dow was down 800 points at 3 p.m. 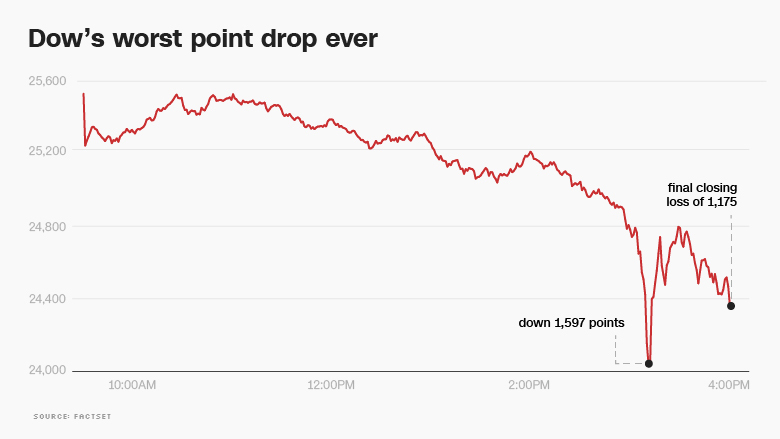 Within minutes, it was down 900, 1,000 -- and then 1,500 points. 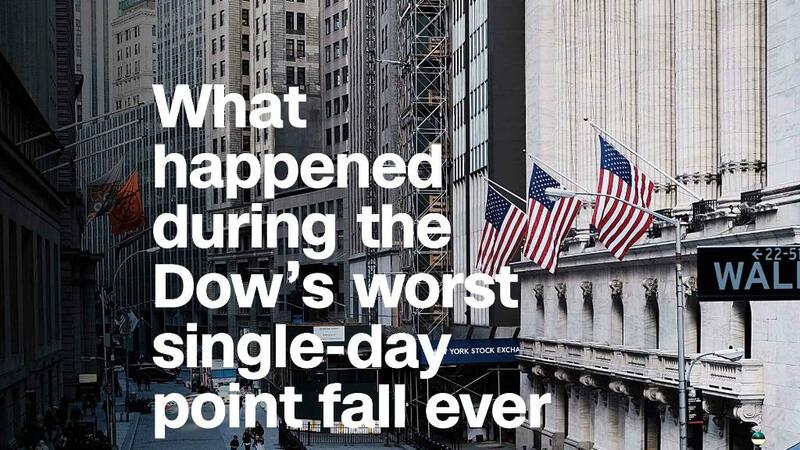 At its low, the Dow was down 1,597 points, before buyers rushed in and limited the decline. The VIX volatility index, a measure of market turbulence, skyrocketed a record 116% on Monday to the highest level since August 24, 2015, the last time the Dow plunged 1,000 points in a day. The spike signifies how calm Wall Street had been -- and how unprepared the markets were for trouble. "Valuations got stretched and that led to a cascading effect today," said Sam Stovall, chief investment strategist at CFRA Research. "The market has to correct itself -- a resetting of the dials -- before this bull market can continue." No matter the cause, the stock market was long overdue to take a breather. Before Friday, the S&P 500 had gone the longest stretch ever without a 3% pullback. Now the S&P 500's record-long period without a 5% retreat is in jeopardy. Despite the recent turmoil, the Dow remains up almost 40% since President Trump's election. The robust performance has been driven by strong corporate profits, healthy economic growth and excitement about the Republican tax cut for businesses. "The fundamentals of the economy remain quite strong," said Janney's Luchini. "It's hard to make the case for why we should be down more than 10% -- unless we encounter negative economic news." --CNN's Liz Landers contributed to this report.